Shopify Payments Gateway is getting selective about which retailers can use the service. Following 14 months of preparation, Bella Vérité launched on Feb. 15 with 30 leading natural beauty brands, including Agent Nateur, Ilia, Indie Lee, Josh Rosebrook, Pai Skincare and Vapour Organic Beauty, using Shopify Inc.’s e-commerce platform and the online store builder’s payment processing service. Soon after, Bella Vérité came to a crashing halt. On April 21, owner Jessica Yardy received an email from Shopify informing her that access to its payment processing service Shopify Payments Gateway would immediately be cut off, and she’d have to find a new payment processing provider. Bella Vérité closed for more than a week as Yardy scrambled to replace Shopify Payments Gateway and was out thousands of dollars in sales as a result. Shopify or its partners have lumped common beauty merchandise such as skincare products with hyaluronic acid, retinol, glycolic acid, kojic acid and vitamin C, skin peels and teeth whiteners into a high-risk pseudo pharmaceuticals category, and Shopify is severing the payments spigot to beauty retail and brand e-commerce sites carrying that merchandise. The exact number of sites affected is uncertain, but beauty e-commerce operations in the United States, Canada and Australia have been dropped from Shopify Payments Gateway and substantial sums of money have been lost. To explain its actions, Shopify directed beauty merchants and Beauty Independent to its terms of service, where it states businesses selling pseudo pharmaceuticals or other products that make health claims are prohibited. Beauty merchandise isn’t specifically spelled out, and merchants are puzzled as to why or how beauty items like vitamin C serum have been deemed pseudo pharmaceuticals. In its email to Yardy, Shopify notes the items in question make health claims. The merchants forbidden from Shopify Payments Gateway report Shopify may not be to blame. They contend Stripe, the payment software firm Shopify depends on for Shopify Payments Gateway, bears responsibility. Stripe hasn’t responded to a request for comment from Beauty Independent, and its role in grouping beauty merchandise with pseudo pharmaceuticals isn’t known. A Shopify spokeswoman explains Shopify’s list of prohibited products and services is in part defined by Stripe’s terms of service. Before being alerted by Shopify, the beauty merchants Beauty Independent interviewed for this article had no idea products on their sites were considered pseudo pharmaceuticals. Once merchants were alerted, they often tried scrubbing their sites of terminology connected with health claims, to no avail. Shopify’s decision to disallow them from its payments service appears to have been quick and final in every case. The company gave merchants no time to 48 hours to change payment processing providers and frequently alerted them on Thursday or Friday with the impending weekend making it challenging to move over to alternative payment processor promptly. Tangie Griffin, founder of skincare brand Vow Beauty and an attorney, says, “I don’t feel that the disclaimer on their [Shopify’s] website was clear enough for the average user to know that, if they created a Shopify site, they wouldn’t be allowed to use Stripe. 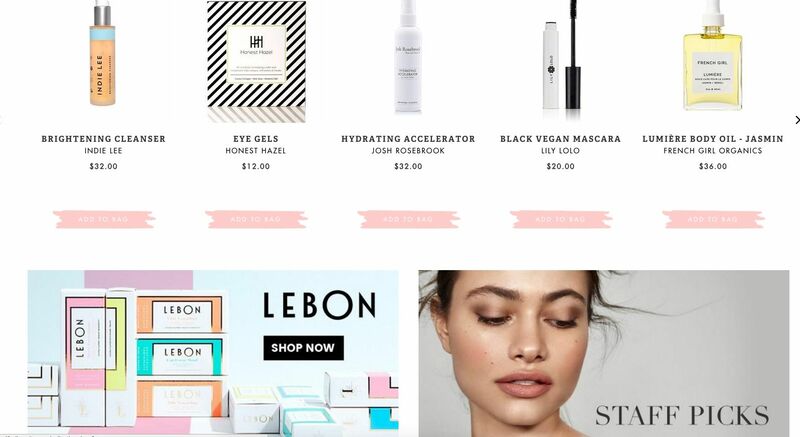 They definitely need to revisit their prohibited list.” Shopify suspended Vow Beauty’s use of Shopify Payments Gateway in the spring, and the brand switched to eMerchantBroker. Becky Waddell, founder of Take Care, reasons, “It was the ingredients and not the terminology. I tried to be cautious about the way we describe products. I know it’s a risky area.” She remembers the email notifying her that her business would be banned from Shopify Payments Gateway in 48 hours as a complete shock. “They were very rigid and inflexible about their response,” says Waddell. “I have been using Shopify for three years, and we are not offering anything different than we did before.” Take Care opted to end its relationship with Shopify for its website. A few beauty merchants discussed chargebacks involving high-risk products as being behind the Shopify Payments Gateway terminations, but they emphasize chargebacks in the beauty segment are rare. The natural beauty retailer Aillea, which employed Shopify Payments Gateway until it was precluded from doing so, has had two chargebacks in two years over thousands of transactions. The two chargebacks were due to credit card theft and had nothing to do with health claims. “It’s never been [that] our product doesn’t work or didn’t performed or deliver,” says Aillea owner Kathryn Dickinson. The founder of another clean beauty retailer who didn’t want to be named says, “If I were a merchant [payments] processor, I would look into that [natural beauty] segment and say, ‘It’s an amazing opportunity because that’s a segment with almost no chargebacks, happy clients and usually customer service that is good.’” As the situation stands without a processor aimed at natural beauty, the founder advised merchants to obtain a secondary payment processor to avoid losing money if they are removed from their primary payments processor. Rumors abound that big brands and retailers are pushing Shopify, a firm that touts its service to small- and medium-sized businesses, or its partners to target upstart competitors. These rumors are based on the premise that Shopify Payments Gateway remains active for larger companies selling beauty products that could be regarded as pseudo pharmaceuticals under Shopify’s definition. These beauty products are incredibly widespread and are stocked by countless stores in the retail and beauty industries. Shopify client L’Occitane, a recent subject of a Shopify case study, sells brightening products that seem to violate the pseudo pharmaceuticals policy detailed to beauty merchants barred from Shopify Payments Gateway. Beauty Independent reached out to L’Occitane to learn if its transactions are handled by Shopify Payments Gateway and hasn’t gotten an answer to date. L’Occitane isn’t alone, though. Target and Glossier are listed on Stripe’s website as clients, and they have beauty products available on their sites with vitamin C.
Beauty merchants formerly relying on Shopify Payments Gateway continue to suffer consequences from being forced off the payments processor. Shopify charges its clients using outside payment processors 1% to 2% fee on transactions. On top of that transaction fee, Yardy divulges she had to shell out $200 to set up Authorize.Net, an alternative payment gateway, and pays $25 monthly for Authorize.Net as well as a 2.9% plus $0.30 per-transaction fee for it. Authornize.Net, which Shopify recommends to beauty merchants excised from Shopify Payments Gateway, hasn’t responded to a request for comment. If you use Shopify, check if you sell products with ingredients that have been labeled pseudo pharmaceuticals by Shopify such as vitamin c, hyaluronic acid and kojic acid. Find a secondary payments processing provider to prepare for your brand possibly getting banned from Shopify Payments Gateway. Budget for Shopify and an alternative payments processor charging additional fees. Has there been any updates since this was first published? Bella Vérité – I’m very familiar with cosmetic formulation and development. I just checked Bella Vérité, many of their products contain more than 30 different raw ingredients (they also only show active ingredients, failed to show other common chemicals), which is very dangerous (they mix them together, if years of stability test is not properly evaluated, they may generate other harmful substances). They failed to label their product properly which is required by FDA. They may also fail to comply relevant rules by FTC. I strongly suggest Bella Verite to check relevant regulation before they make a conclusion that Strip and Shopify shows bias. Cosmetics are also science. Cosmetics are not simply mixing things, they are science, need to be taken care by professionals. Cosmetic industry need to be regulated tightly, so many low-value products on market. BTW, the label information of current Bella Verite website already fails FDA label regulation for cosmetics. Everyone can report this site to FTC. The “funny” thing is, seems like it’s the major credit card companies who are behind the situation, yet Shopify and Stripe would recommend to use Authorize.Net which is own by… I kid you not… VISA. That’s a smart way to charge an extra fee to small businesses. We had not heard of this issue impacting Squarespace and will definitely look into it. Thank you for alerting our readers! So what are people using now instead??? It’s the payment processing that’s banning it, you still can list your products on Squarespace and Shopify, but will have to signup with a different gateway to accept payments. Both Paypal and Amazon Pay accept it for example. If you are needing a payment processor please contact me we do this category. Does anyone of this is still an issue, and if so, what software are people using now instead of shopify? You can list your products on Shopify, but will need to find a different gateway to accept payments. Sad. Contact me ay Sylvi@ZenPayments.com if you need a domestic merchant processor. Zen Payments has partnered with a processor here in the US to offer customers a fully domestic credit card processing solution tailored towards the CBD business and beauty business where Spotif specifically has targeted supplements, vitamins, skin brighteners and whiteners, teeth whitening, skin peels and lightening products, and products that contain hyaluronic acid, retinol, glycolic acid, kojic acid, vitamin C serums and hydroxy acids. Whilst I am not using the Shopify platform, my Stripe processing contract was recently ended too for the same reasons – a quick brutal email stating we were a “Pseudo-Pharmaceutical” company, a week after launch. Except we aren’t, R10 Labs is a 100% Natural Men’s British Skincare company. We make no claims other than every single ingredient has a natural origin. That would be anti-irritation for a shave gel, which isn’t a medical condition, nor is anti-ageing and I haven’t stated anything about Revitalizing mind or body. It really does seem Stripe is finding ANY excuse they possibly can, even though ALL of our products fully abides by EU Cosmetics Regulation ((EC) No. 1223/2009) and are manufactured in an ISO 22716:2007 accredited facility. However it seems that Lush use Stripe and make FAR more claims than we do, have Stripe closed their account? So it does make me agree with Kathryn Dickinson that Big beauty is threatened by the rise of green beauty, Stripe is NOT the saviour for Startup companies, even if your company isn’t affected, would you want to have business dealings with a morally bankrupt company? Whilst it’s not directly Shopify’s fault this occurs, they do have the power to either consult with Stripe or atleast decrease the charges for using another Payment Processor. Luckily for me, I am not using Shopify and had a direct account with Stripe, I was given 5 days to find another Payment Gateway. My advice to ANY body looking to or already has a Cosmetics company… Stripe WILL close your account, it’s obvious they are looking for any excuse possible, DO NOT use Stripe or Shopify. What about essential oil products or any oil based serums? The email from Shopify that brands have received mentions the following: supplements, vitamins, skin brighteners and whiteners, teeth whitening, skin peels and lightening products, and products that contain hyaluronic acid, retinol, glycolic acid, kojic acid, vitamin C serums and hydroxy acids. I wanted to sell some Vit c products and might I say what is so pseudo about a natural vitamin that we ingest in any case??!! The payment processing issues have affected countries outside the U.S. such as Australia and Canada. We can’t confirm that they have affected the U.K., but they don’t seem to be constrained geographically. Yes, I had my store de-Shopify-paymented (haha, new word) and our main product is Vitamin C. They specifically mentioned it in the email I received. I’m in New Zealand. Yet people can spew hate and ignorance and even sell/purchase merchandise that supports their idology, but sugar based acids are banned? This is awful, rude and disgusting to small businesses affected. Shopify and stripe processing will loose a lot of small businesses, business. I myself, use big commerce if that helps anyone. I love it! It’s always ever so changing for the new world of technology. Keeping my business up to date. And I have never lost revenue because they changed something. I have never had a problem. It’s a monthly payment of $25. The payment processing is Autherize.net. It’s been great for me for over 10 years. I sell eyelashes with adhesive, which I don’t think it’s a problem. Thank God i didn’t ever use Shopify for its service. As for Dominque Caron, to help you save money on Photography. Check out PowPhotography.com. Tell them D’Lashes sent you or anyone else reading this. You can get professional photos for your products at great price. Which is how I shoot all of my products for e-commerce or whatever I choose to use the photos for. Reading this article is helpful for me giving advice to other businesses not to use Shopify for their beauty products processing. I hope I could share some solid advise to save money any of you from this horrible experience. The is not good business for Shopify not to reaponde back for all the beauty businesses affected by dropping businesses from their e-commerce processing. Which as a result of businesses losing revenue! This makes me upset that this could of happened to me too. I hope this little comment helps someone save money in the meantime on their e-commerce business. The loss of revenue and disruption of brands servicing their customers plus the possibility of a negetive brand perception could open the door to a class action against Shopify. Bringing forth a case is something to consider as it seems that certain brands may be getting a pass and others are being dropped at a moments notice. You took the words right out of my mouth. These independents need to sue Shopify, or Stripe for lost revenue in perpetuity. Stripe is hiding behind their prohibition of health “claims”, when in actuality, the content with any said claims can just be removed. The products themselves, if legal, shouldn’t even be an afterthought. Asking that unproven claims be removed is precisely how Amazon, Walmart.com and other marketplaces handle it. Shopify doesn’t have a legal leg to stand in.